A water feature, as shown in Figure 1, placed strategically in a landscape or garden provides a dynamic element to what is usually a static design. 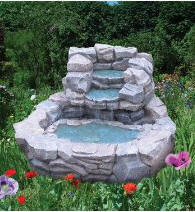 Water features, such as water fountains, provide tranquility and a sense of calm. The sound and visual effects provided by flowing water are known for their soothing and stress relieving qualities. As a side benefit, water features, fountains, ponds and streams have been known to increase property values by as much as 10%. Water features can be as simplistic as a water fountain type statue, to highly complex designs that mimic natural features with multiple terraces and water cascading over a rock bed. Water flow can be slow or swift, with the feature used as a background or as the predominant design element. Only your imagination and budget control the final appearance. Water features such as water fountains will attract wildlife, from an abundance of birds to squirrels and chipmunks and depending on the location of your property, larger animals such as deer, can be seen at ponds and streams. 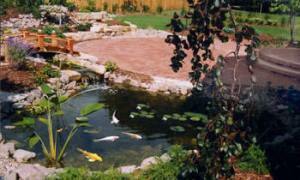 Depending on your climate adding fish to ponds and streams enhances the overall water feature. The addition of a water feature allows you to dramatically expand the types of plants and flora that can be incorporated into your landscape. Many individuals hesitate when considering adding a water feature because they feel that they water fountains, ponds and streams are complex to install and require a great deal of maintenance. The complexity of the installation is relative to how dramatic the water feature is and the level of maintenance is relative to the initial investment in the quality of the pumping, aeration and filtration equipment installed. 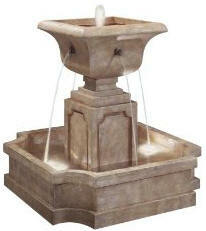 Many water features, such as water fountains require very little maintenance. In the past it was necessary to buy numerous components for your water feature and hope that all the different pieces of equipment were compatible with one another. Now many manufactures are supplying complete kits that contain all of the necessary pumps, filters, aerators, piping and connectors to ensure that all of the pieces of hardware work in conjunction with one another. Figure 2 is an off-the-shelf water fall kit. Once you have decided that you are going to install a water feature within your landscape, check with your municipal building department for any special requirements and if a permit is required. 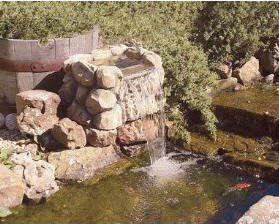 Remember that water features are difficult to relocate and usually expensive to modify. Planning is the key to success. Numerous outdoor water fountains and water features, as shown in Figures 2, 3 and 4, can be purchased and require very limited assembly or installation skills.